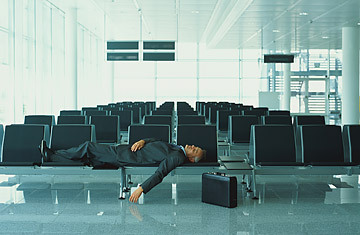 A New Pill for Jet Lag? Is there a medical condition more emblematic of the modern age than jet lag? Dislocated and deadened, the sleep-starved traveler wanders through meetings or tourist sites in a somnambulant haze. Now an experimental drug promises to reset the body's internal clock and banish jet lag zombies for good  and, surprise, it comes in a pill. Melatonin, which is available over the counter in pill form, is a known treatment for jet lag, but the substance can't be patented, leading drug companies like Vanda Pharmaceuticals, the maker of tasimelteon, to rush to develop drugs that imitate it. Dr. Irshaad Ebrahim, medical director of the London Sleep Centre, says the recent study, published Dec. 2 in the journal The Lancet, confirms what experts already know. "I'm not sure this adds anything. Melatonin itself can be quite effective on its own. So, of course, something that mimics melatonin would show promising results," he says. Still, a melatonin-emulator may offer some utility, Dr. Ebrahim says. Currently in the United States and many other countries, melatonin can be purchased easily as a health supplement, but supplements are unregulated and vary in quality and strength, making it difficult for consumers to receive a consistent dose. In the interim, Dr. Ebrahim says, sleep experts have developed more reliable  albeit more complicated than popping a pill  methods of altering the body's natural melatonin production, which may help some of the 100 million people who take international flights from the U.S. each year, and the millions more who live in a perpetual state of jet lag due to night-shift work. One strategy is to use light-dark exposure, which helps cue the body's circadian rhythm. British Airways, for example, offers a "jet-lag calculator" that applies research into bright-light therapy to advise passengers when to sit in a pitch-black room and when to seek bright light after a flight. Melatonin, as well as its analogs, have the added advantage of being less addictive and safer than other sleep-inducing medications. (The current study reported no immediate adverse effects of tasimelteon, though participants were not examined the following day.) In recent years, the popular prescription sleep aid Ambien, for example, has been linked to a range of bizarre sleepwalking incidents, including air rage. In a high-profile case in London in 2002, REM guitarist Peter Buck was cleared of assault and drunkenness charges stemming from his destructive rampage aboard a British Airways flight, after successfully claiming that his Ambien pill  combined with several glasses of wine  caused "non-insane automatism," which rendered him unable to control his actions. Situations like Buck's may make this new research all the more attractive. Better yet, consider the case of Sarah Krasnoff, probably the world's most extreme jet-lag sufferer. In 1971, caught up in a custody dispute over her teenage grandson, Krasnoff learned that she was not subject to custody laws in the sky. That summer, she made about 160 continuous flights between New York and Europe with her grandson. By the end of the summer, Krasnoff, 74, collapsed and died of a heart attack.